First off, Happy Halloween! We were so excited for Saoirse to dress up this year. When she started losing her hair, we would talk about who she looked like now that she was bald. We really liked the idea of making her Uncle Fester for Halloween, and so that's what she is! I made the costume using thrift store finds (where I also found her 3 pairs of shoes, a pair of winter boots, two toys, and a new dress for me). I love piecing together costumes instead of buying them off the rack. It's so much more unique. She was having kind of a crappy feeling day today, so we didn't do much in the way of celebrating, but after her afternoon nap, she put on her costume and stayed in it until we "trick or treated" to the neighbors' houses. We are home. After six days in the hospital, it is good to finally have the whole family home together. This chemo was a kicker, but all things considering, Saoirse did very well through it. The first two days flew by, and then she had the total puke day, and then she mellowed out a bit. The last three days have been better as they go by, consisting of mostly sleeping with a little eating and playing mixed in. We are keeping her on a pretty intense regimen of anti nausea drugs, and they all make her sleepy; plus her body is working hard to handle the amount of chemo she had. She wanted to eat more today, and although she threw up a bit this morning, she took in more food than she has in the past few days. We abandoned milk, because it seemed to be upsetting her stomach, so we are sticking with bland foods and formula. It seems to be working, and we are hoping we can get through tomorrow without any puking. Fingers Crossed! I think the hardest part of this round of chemo was the fact that it had to happen. In the realm of what could have been, Saoirse really handled the side effects well for the amount of toxicity she received. But I have been having a really hard time with the additional round. We are working so hard to make things go smoothly for her, and to keep her toxic exposure as minimal as we can, while fighting an extremely aggressive disease. We were hoping that the 3F8 antibody therapy would help to keep her from being exposed to the extreme toxicity of the chemo that comes with stem cell transplant. When this round came up, I just wanted to refuse. That sounds awful, but I wanted to keep her from experiencing another round of chemo. I was so excited for the fact that she was done with the toxic drugs, and horrible side effects, and would be able to start getting her energy, appetite, and freedom back. And I think the biggest disappointment was the tease of having a clear bone marrow that turned out to be false. 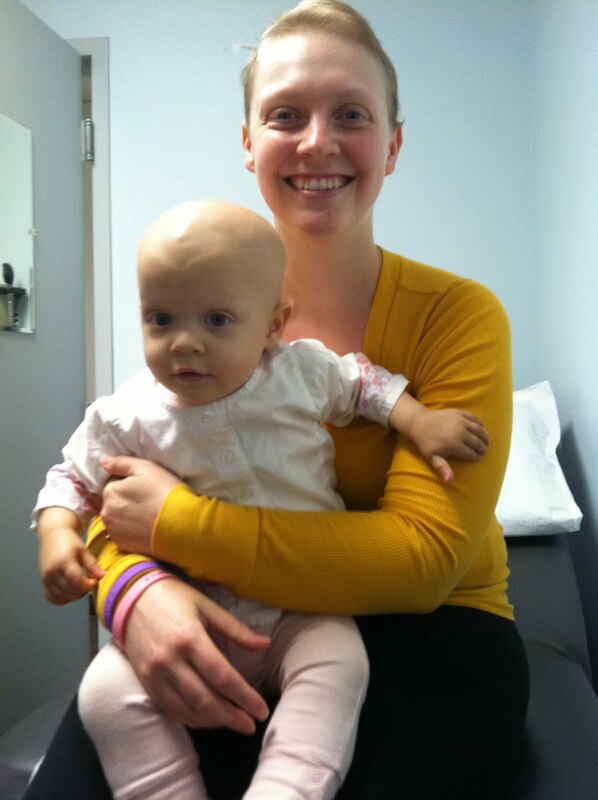 She had responded so well to treatment, and I really felt as if she was more "normal" after her round six chemo. I know she has so much less disease than she had when she was diagnosed, but it just was such a let down. I think I could handle seeing her experience things that I went through, knowing that it was worth it in the long run to make her better, but when she started experiencing things that I didn't have to do, like surgery, mucositis, and super toxic cocktails, I started to feel like I couldn't help her as much. This is territory I hadn't done, and I couldn't look at her and tell her that everything would be alright anymore - because I didn't know. The fear of the unknown crept in and bit me, hard. All I can do now is keep hoping for full NED status, and to get to New York and start the next phase of treatment. I like to stick to a schedule. We will be staying home for the next few days to avoid car sickness and more puking, but I hope that she will start to perk up in the next day or two and that we can do some fun things before we head to New York. Tomorrow is a new day! You are in my prayers. Your daughter is blessed to have a mother like you. I can't imagine how you must feel but I wanted to offer this verse to you from Psalms 30:5"...in his favor is life: weeping may endure for a night, but joy cometh in the morning." I love her costume, but I especially love the expression on her face in the second picture. Such a cutie. My hopes and prayers are with you! Great Costume, she is so cute.....You are a great mother and your strength is what will help her through the trying times!!! Have a great week! You are a great mom and she looks so adorable in that costume. Praying for her full NED results. Following your posts and amazed at how strong you are. Your an amazing family. My continued prayers and thoughts to you all. I have been following your families story since I read about it in the Salem Evening news. You are an awesome mom, love the costume she is adorable. Try and sit back and take a few breaths as this is important for yourself. You are doing a great job and it shows. My thoughts and prayers are with you and your family durning this difficult time. Gorgeous little girl! This is so cute! You've been in my thoughts since cnn.com covered your story. God Bless you little one; you are in my forever prayers. God bless your child, and both of you. Your story touched my heart on cnn.com - I have made a small donation and want you to know your little girl and you will be in my prayers. One could only imagine the strength you guys have and again, will be in my prayers. what a great costume idea. i wish you all well during this time. i loved your post above about the aging of kids in oncology. is there a fund where people can donate? i note that your husband lost his job recently. So adorable! :) My prayers and hopes are with you. I hope everything turns out great for you! :) Stay strong.